- Average Sensitivity: 1W@1M@94 DB. Purchased two sets of these speakers for a swim club venue. Outdoors, under eaves, protected from sun and direct rain. They were powered from a Crown 202 amplifier, driving only 150 watts per channel. I had hoped to use them for ambient music plus occasional voice paging. One set of speakers lasted three weeks, the other less than a week. Under a mild load, the woofers on BOTH sets were blown. Have tried to obtain service through Pyle Service Center, but to no avail. I would give these less than 1 star if the rating was available. I am a touring musician, and have set up countless indoor and outdoor PA setups. Do not purchase these if you are at all attempting to use them for vocal paging. They might be good for ambient music, but should be rated for far less than the 350 Watts/Channel listed. use them in your backyard or in your garage, but do not use them in any professional setting. 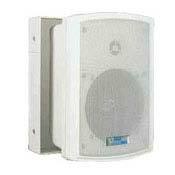 Hello, I'm simply updating on the Pyle outdoor speaker. We had a rather large Independence Day festival around the old building where I have the Pyles installed. They worked very well, many positive comments. Music was played through them all day - announcements were made as planned. I'm still very satisfied with the Pyles! 350 peak watt rating I currently use two per channel for a 4 ohm load to a single channel of a stereo amp rated at 175 per side at 8ohms. Great outdoor construction. Rugged cabinet. Off white but could be painted. Connection terminals easily accept #12 wire. Terminals are covered by a rubber like cover. Good aluminium mounting bracket, allows for easy positioning of the speaker. Has an Indoor/Outdoor switch to boost bass a bit for outside. Likely due to high mount and outside, can't tell much difference here. Sold in pairs. Due to being mounted high and outdoors, a bit weak in bass. Only a six inch woofer but bigger than most in these outdoor types. May be a bit larger than some may want, not a issue for me due to high mounting. Just over 12 inches tall. I was searching for outdoor speakers to use for a permanent installation on an old historical building that hosts outdoor events during the warmer months. I needed speakers not only to provide music but double as a PA syestem for announcements and such during our events. With a peak rating of 350 watts and high SPL, I chose the Pyle PDW R63. I plan to have at least two per side of this building, six currently in place on three sides, hopefully two more soon after some maintence work is completed. So far, I am very pleased with the Pyles. The music is background and outside so I'm not expecting any loud or thunderous bass. The Pyles give a pleasing sound, able to get louder than we need. They work well as the PA, which for us, is their most important function. Not as loud as a horn system, but adequate. As we complete the installation and use them more, I will update but for the money and good construction, Pyle has a good speaker. No experience with outdoor speakers. I have used my portable PA outside, of course, but the Pyles are the first true outdoor speaker I have used. Slightly light in the bass, somewhat larger than I expected, not the most elegant appearance. The Pyles ended up being larger than I anticipated, and so they are being used to provide music in my garage rather in my backyard as I had originally intended. I am currently seeking something a little smaller to tuck under the roof around back. Still, it makes listening to music in my garage a lot more enjoyable. They are currently replacing the standard speakers that came with a Sharp minisystem and impressively fill a 3 car garage with sound using very little power (estimated at a couple/few watts). The sound is forward and dynamic, if a little light in the bass, with a tonal balance and efficiency similar to Klipsch SA series speakers, for a substancially lower price. However, I believe that the Klipsch's are a better speaker for critical listening since to me they sounded more refined. However, I don't do any critical listening in either my backyard or my garage, so I could not justify spending a whole lot more money for use in those settings. I also gave these things a work out with my Carver TFM-25 amp and they played without audible strain for extended periods at very loud SPLs. I suspect that they would make a good college party speaker since they are mostly "spilled-drink resistant." As for my scores, I can identify about as many speakers that suite my tastes better as worse than these Pyles, so I think they are about or slightly above average. However there are no speakers that I am aware of that provide the efficiency or sound of these units at anywhere near the price. I believe that efficiency is an extremely important characterstic in outdoor speakers when the audience will be listenting from a good distance away. I can turn my whole backyard into a music-filled playground and the speakers sound like they are accomplishing the task effortlessly. In my experience inefficient speakers, regardless of their power-handling ability, rarely sound good when playing loudly. BTW, most outdoor speakers do not have high efficiency. So, if your goals are to generate a convincingly big sound in a big place for a convincingly smaller budget, I'd heartily recommend these Pyles, and you needn't have spent a lot on the receiver or amplifier to power them either. My musical tastes include blues, pop, rock, classical, jazz, and a lot of new age.